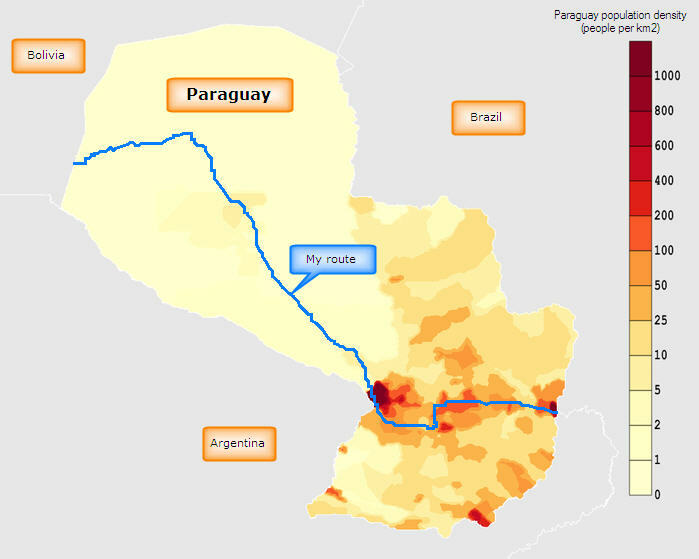 Before I set off on my epic journey, I didn’t know a great deal about Paraguay – apart from: the country is sparsely populated (6.3 million inhabitants in an area of 406,752 km² / 157,048 sq miles – as a comparison: the UK has 62 million in 243,610 km / 94,060 sq miles), 30-50% of the population live in poverty, and it is more likely that the people you meet speak Guaraní than Spanish. 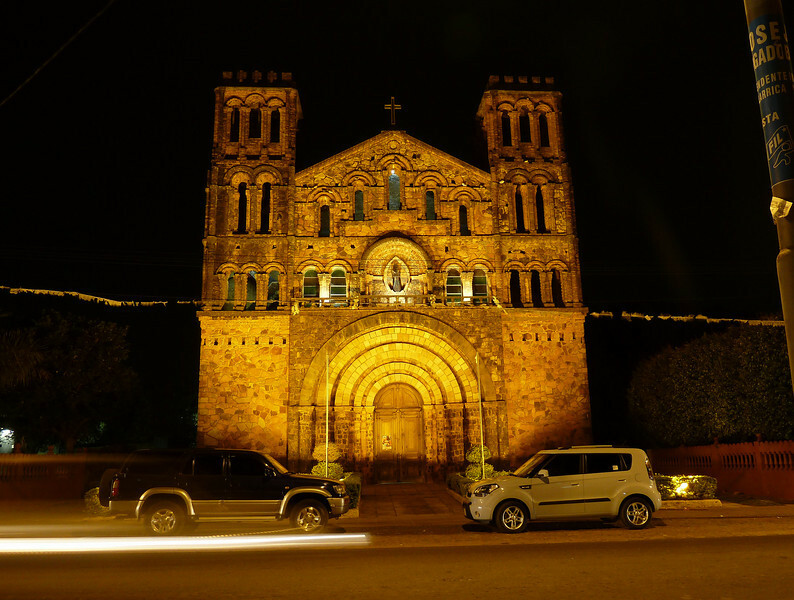 West of the capital Asunción towards Bolivia spreads the hot and semi-arid Gran Chaco which is rather remote and potentially dangerous but also home to a number of German-speaking Mennonite communities. Well, I travel to learn, so bring it on. To be on the safe side, I stock up on vitamins before leaving Argentina by devouring embarrassingly vast quantities of fresh fruit at the breakfast buffet – you never know when you get the next opportunity. 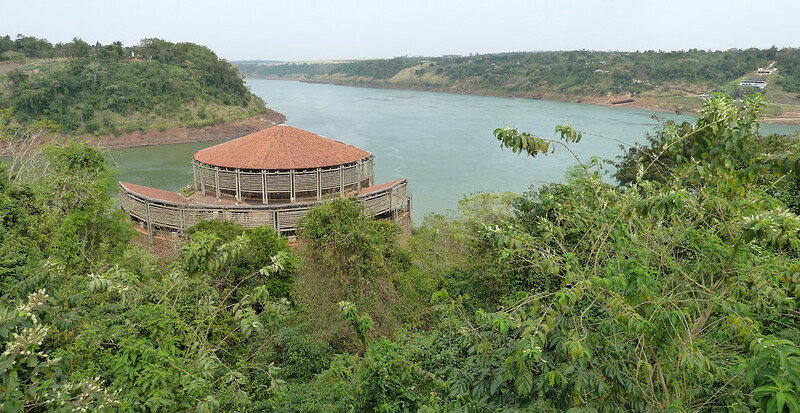 Then I enquire about the border controls that lie ahead, as you have to cross a corner of Brazil if you want to go from Puerto Iguazú in Argentina to Paraguay. I am a bit nervous because I don’t speak Portuguese. No se preocupe, señora, don’t worry, say the nice people at the campsite, it’s all very straightforward. 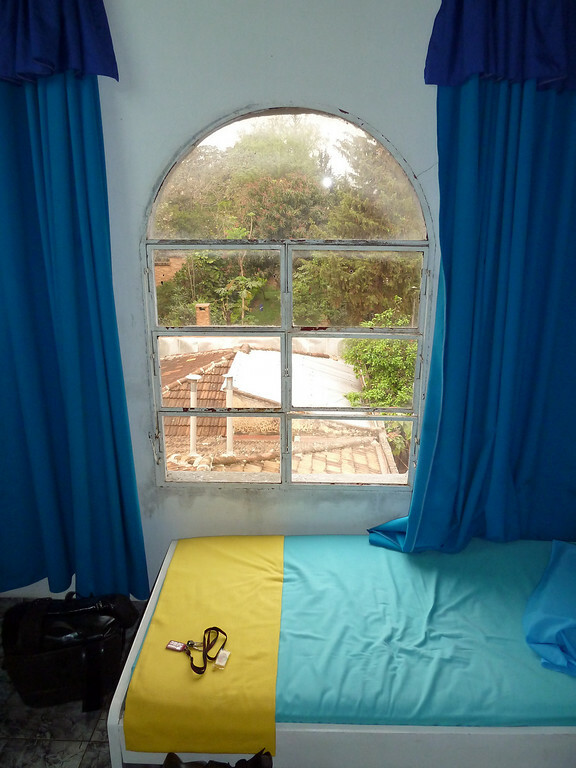 While packing my stuff on the DRZ, I chat to Javier, gardener, 24 years old and soon father-to-be of a little daughter. Motorbikes are such a great opportunity to start a conversation – wherever you are. I love it. The Argentinean border crossing is busy and efficient: I hand over passport, bike registration and temporary import documents – buen viaje, have a good trip, and through. 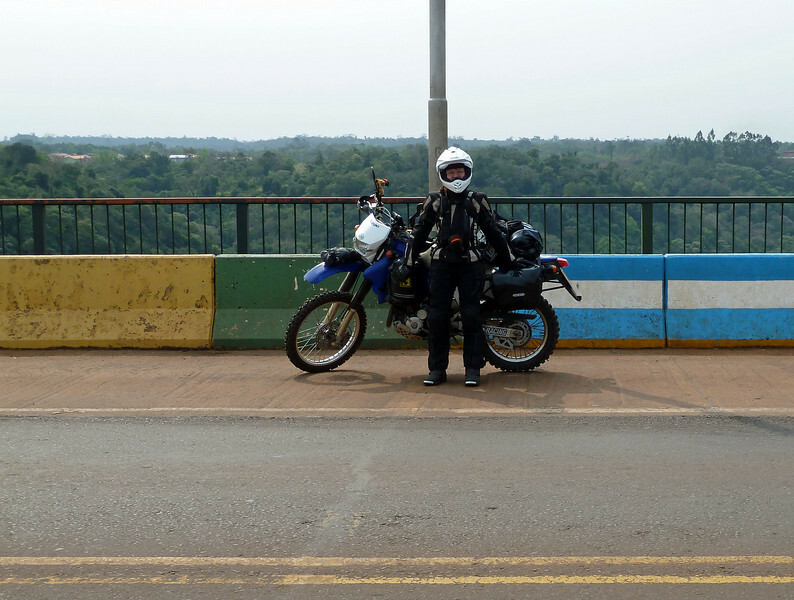 Of course, I must stop on the bridge over the Río Iguazú and a nice elderly señor takes pictures of me with one foot/wheel in Argentina and one in Brazil. 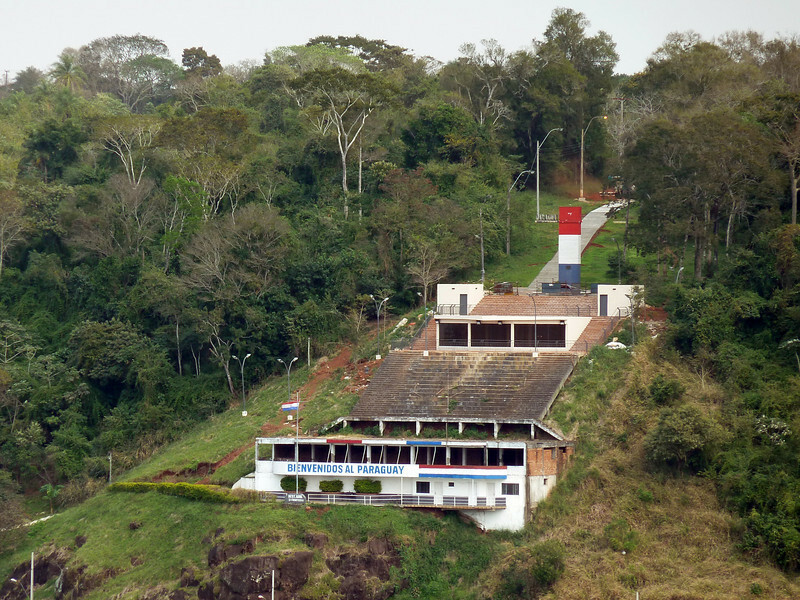 At the Brazilian border post I just say that I want to go straight to Paraguay and get a simple transit stamp in my passport – without any further questions or fuss; it’s usual practice here. Shame really, as the rather handsome officer I’m dealing with is an absolute pleasure to look at (I hope Possu doesn’t read this too carefully… ). 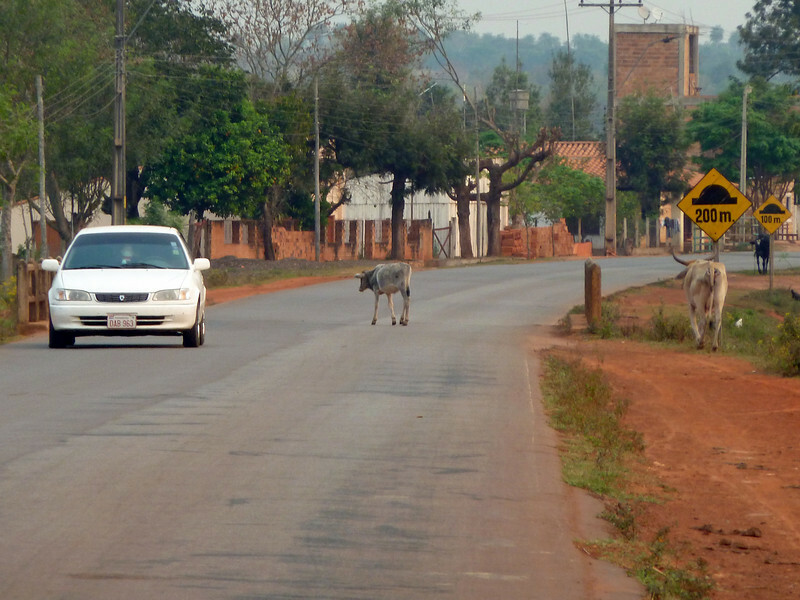 Then I’m battling my way through the heavy traffic towards the Paraguayan border. Many people try to stop me but they don’t look official enough to get me hesitating. Hundreds of motos are whizzing past, I just follow the herd and then suddenly the lanes split and I find myself in a 20cm wide groove that leads the motorcycles through the border installations. There is no opportunity to stop and ask how this all works, if and where I have to show any documents and so I keep drifting along. 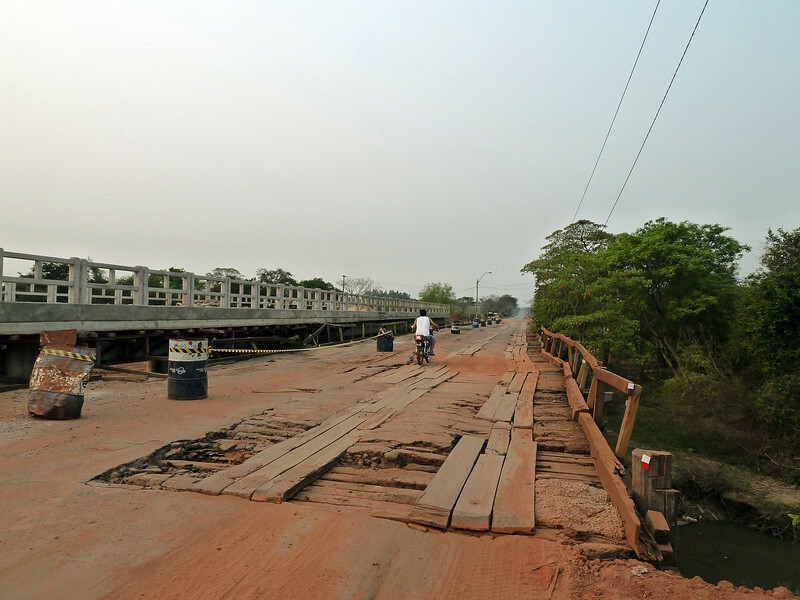 We reach the bridge over the Río Paraná where the two-wheeled and the four-wheeled vehicles meet again and I instantly become a mobile chicane – with my panniers I can’t just filter through and a massive queue of beeping bikes forms behind me. Fortunately the cars are moving a bit forward and I can slip into a gap to let the other motos pass. Phew. Right, are we there yet? 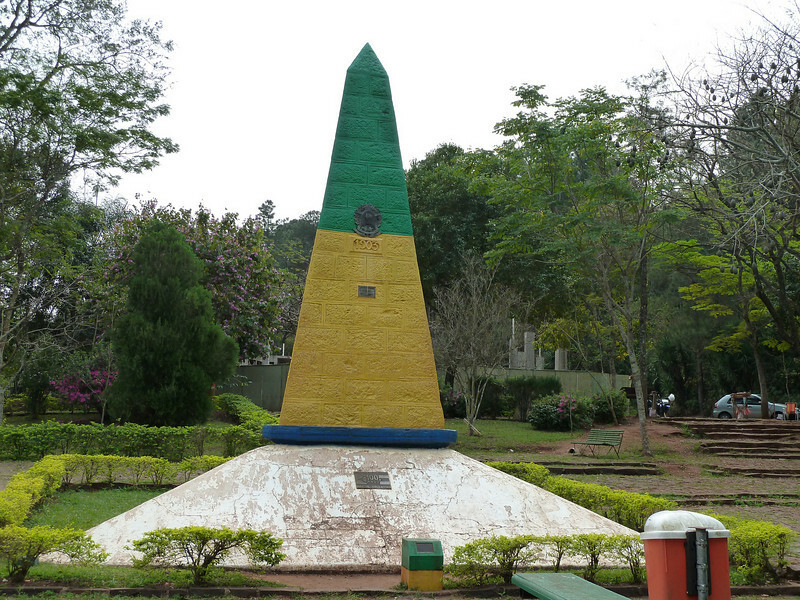 This looks like we are already in Ciudad del Este (City of the East) in Paraguay. But I surely need an entry stamp in my passport and temporary import papers for the DRZ? Ok, in Germany we have a saying: the police, your friend and helper, and so I head straight for the next officer who’s trying to install some law & order into the traffic chaos. 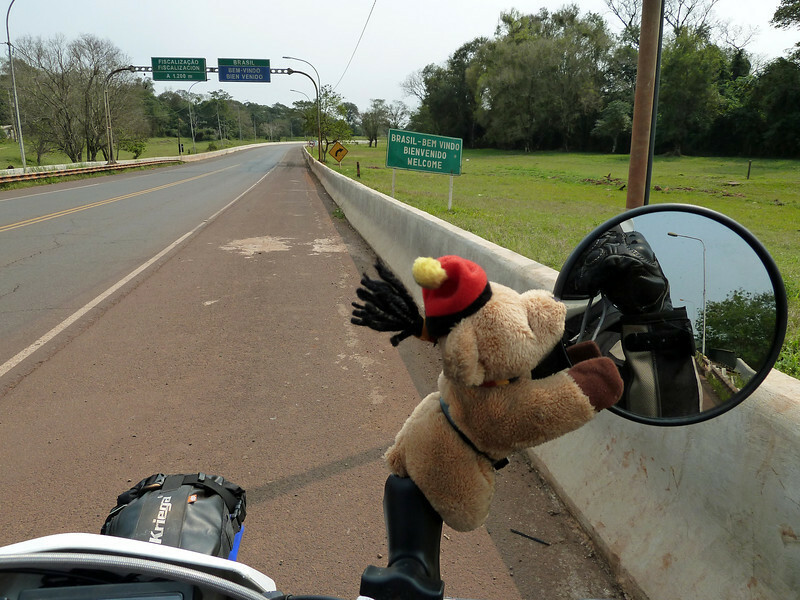 Although busy, he takes the time to welcome me to Paraguay and point me to an inconspicuous white office block on the other side of the road – in the meantime, the local motorcycle taxi drivers will look after my bike and luggage. 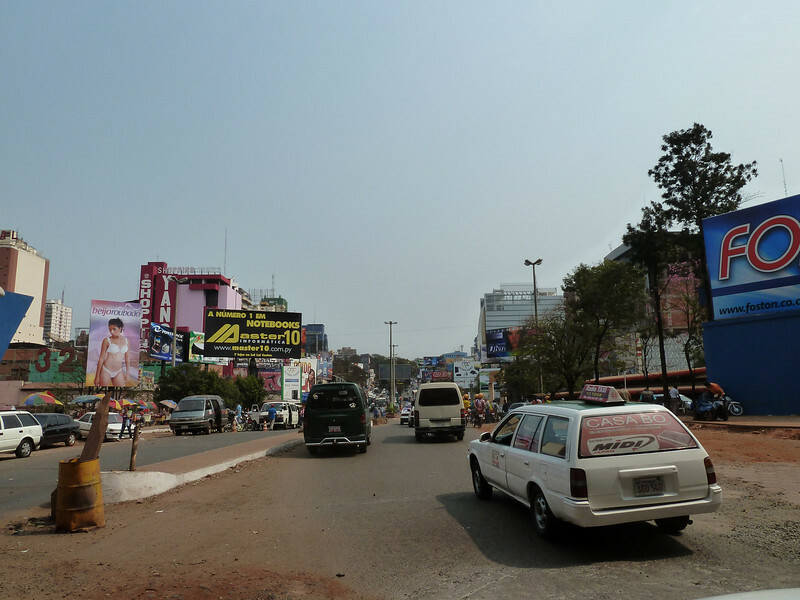 An impressive female officer governs over the crew in the immigration office; we chat about my trip, she stamps my passport and sends me off – enjoy your stay in Paraguay. What about customs and the temporary import of a foreign motorbike? 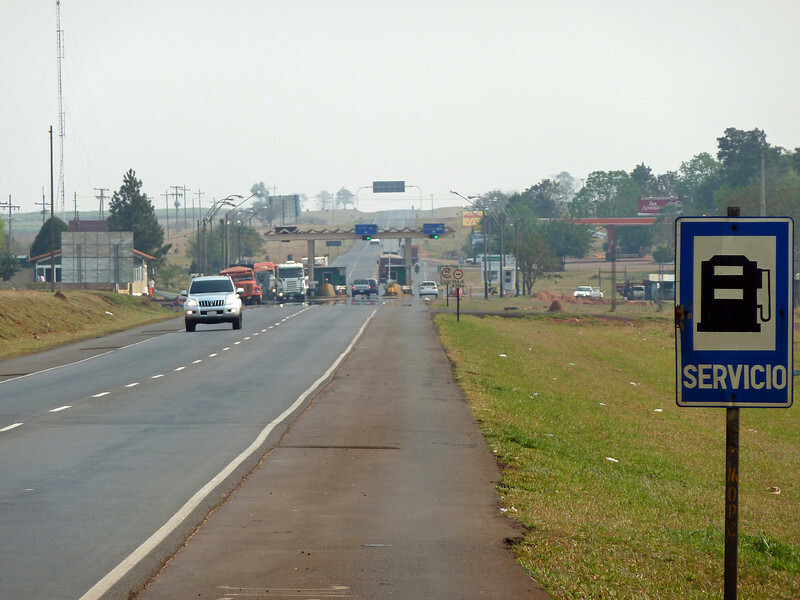 Not necessary in Paraguay, even though I ask several times because I find it hard to believe. 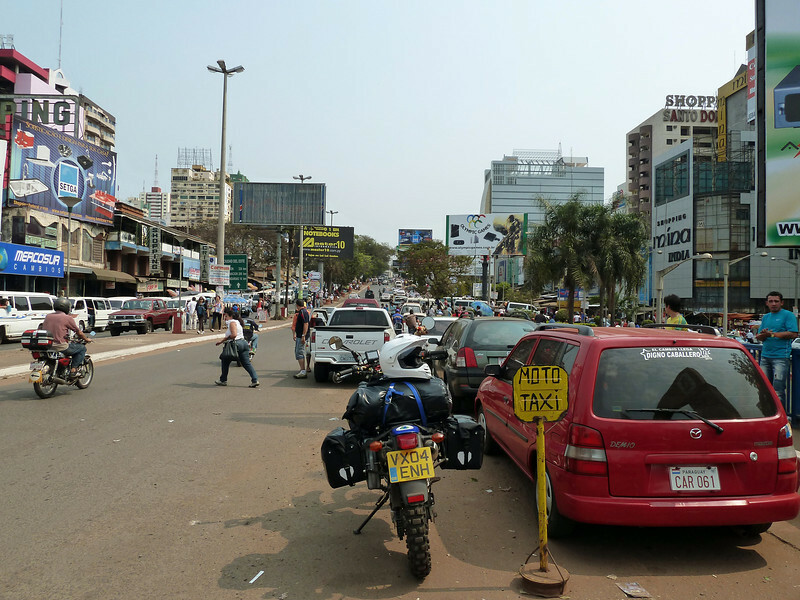 When I come back to the DRZ, there are even more moto taxis and their owners, we chat and laugh and I have to answer many questions about the bike and my journey. Oh, and I need money but as it is Saturday, all the exchanges are closed. No problem, my favourite police officer speaks to a few locals and introduces me to a money-changer who gives me a very fair rate for my US Dolares. 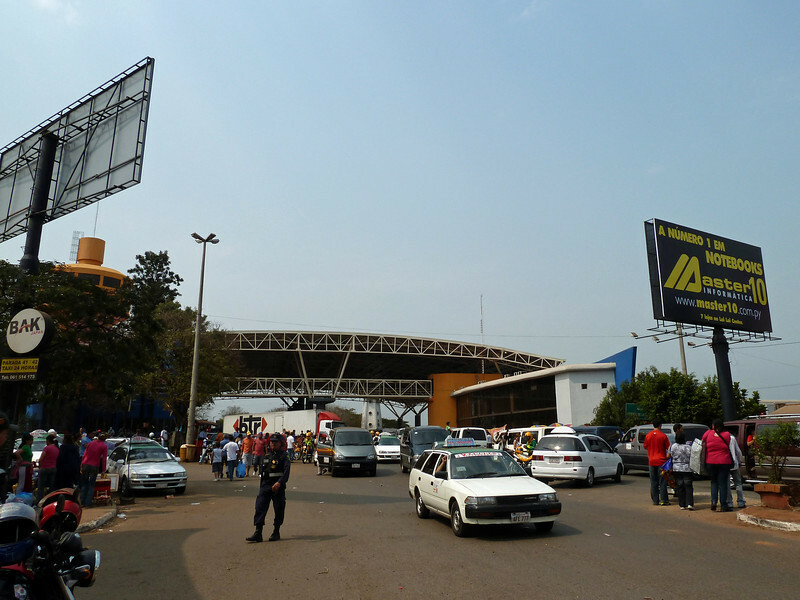 But then the culture shock of this giant shopping centre called Ciudad del Este becomes too much – I want to get out of this hectic place and into the countryside as fast as possible. It is hot and again, a lot of people try to stop me and shout their latest offers at me. 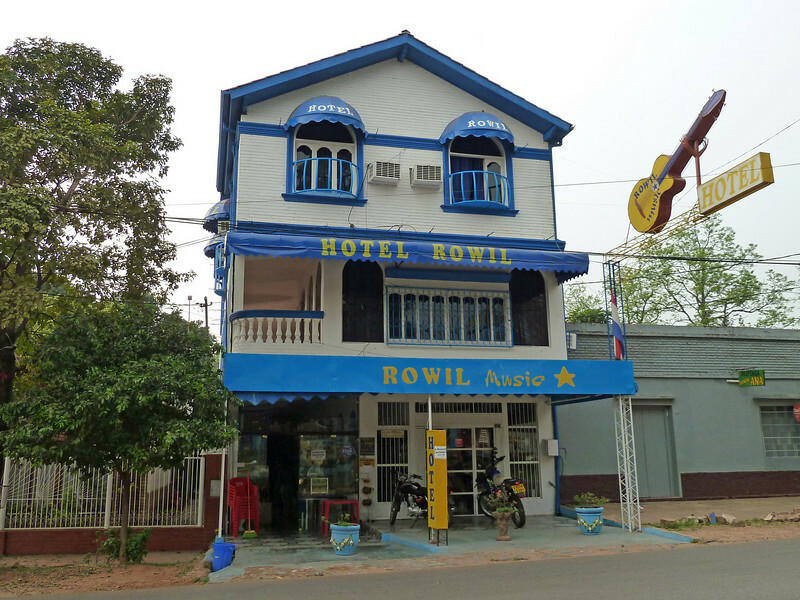 I’m sure, if I was after cheap electronic goods I could grab some bargains here, however, I only have a small bike with limited luggage space – so which part of no gracias don’t you understand? 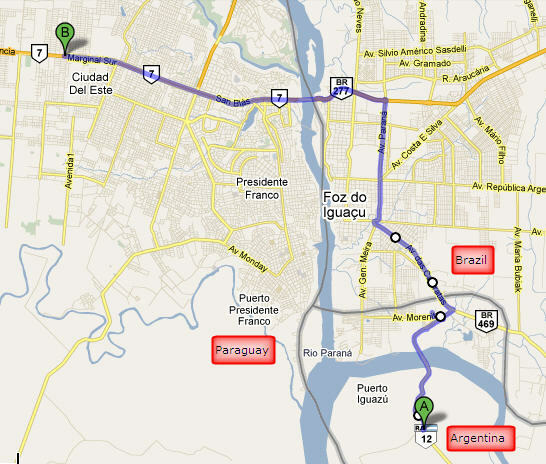 Finally I reach the city limit and join the Ruta 7 which leads to Asunción. The land is plain, grassy and pretty flat. 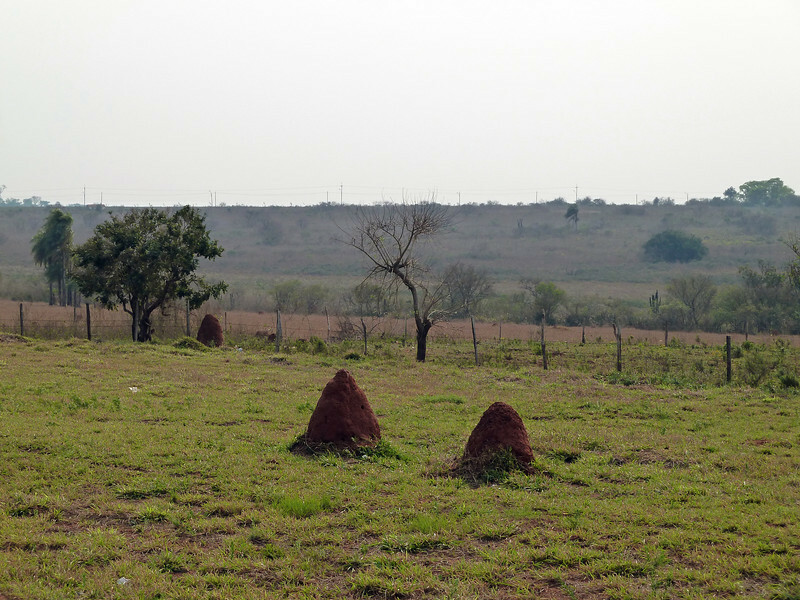 For a long time the only hills around here are the termite mounds along the road. Occasionally I pass a toll booth, but motorcycles are exempt and even have their extra lane to go round the barrier. 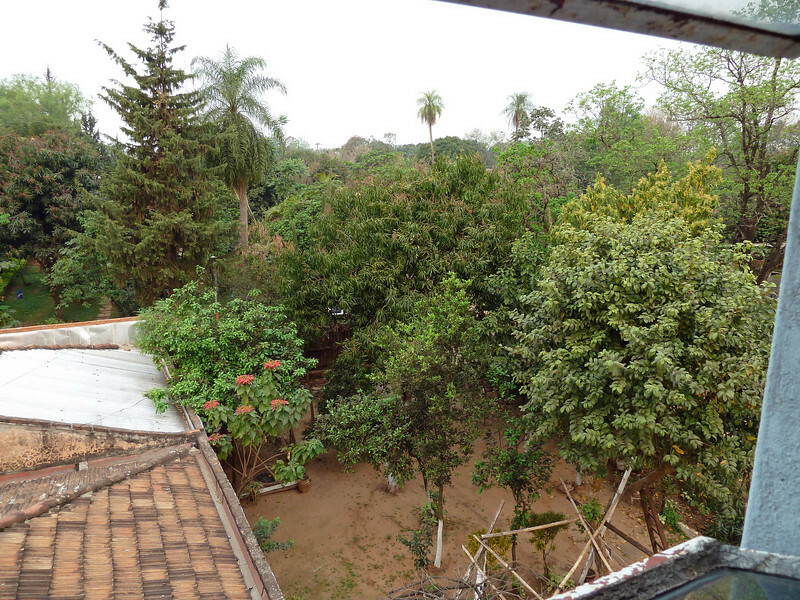 … with a nice view over the garden – including breakfast for £9.50. It’s a Saturday night and the whole town is in party mood. Cars are promenading up and down the high street with huge booming stereos in the boot; drivers and passengers are laughing and cheering at the people in the streets. Everyone is friendly and greeting me; I haven’t seen any other gringos here so far. 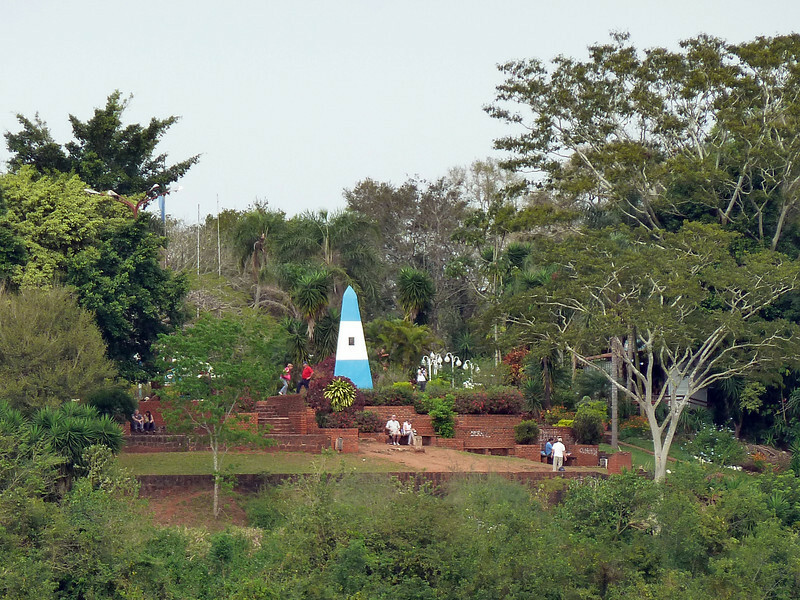 I walk around until midnight, savouring the atmosphere and the balmy air, chatting to the locals – and just enjoy being here in Paraguay. What a charming country; I can’t wait to explore more of it!